Todd Ricketts has been involved in Republican politics for years. In 2016, he ran two dark money organizations and a super PAC. He is a son of Joe Ricketts, founder of TD Ameritrade and a prominent GOP donor. The Ricketts family owns the Cubs. Ricketts and his wife are also co-owners of a bike store outside of Chicago, Higher Gear. Ricketts and his family were initially part of the “Never Trump” movement, prompting a tweet from then-candidate Trump warning them to “be careful.” The Ricketts switched their position, however, after the real estate mogul became the GOP’s presidential nominee and began raising millions of dollars to support his campaign. 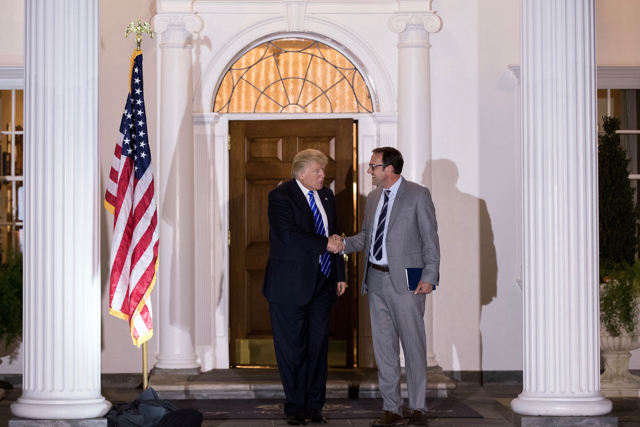 In early December, Trump named Ricketts to be deputy commerce secretary. In late 2016, Ricketts took over 45Committee, a dark money group founded by his father. Ricketts also took over an associated super PAC, Future 45. Ricketts raised money for 45Committee by courting big donors who were reluctant to be publicly identified with Trump. 45Committee has also provided about half the funding for Future 45. Ricketts is also director and CEO of Ending Spending, a dark money group that his father founded in 2010. 45Committee reported spending just over $21 million on ads supporting Trump, making it one of the top spending dark money groups this cycle. It made the vast majority of its expenditures in the last month of the campaign, including a $13 million media buy on November 2. Future 45 spent roughly $24 million on ads opposing Democratic nominee Hillary Clinton. Ending Spending, which describes itself as nonpartisan, spent more than $2.6 million in 2016. The group supported Republican U.S. House and Senate candidates but also opposed a few GOP primary candidates in Nevada.